I never thought as a cultural resources intern working in the National Park Service, that I would be very interested in an old railroad tunnel. That was before I learned about Indigo Tunnel. The C&O Canal National Historical Park has three main emphases written into its enabling legislation — preservation and interpretation of the historical resources, protection of natural resources, and providing recreational opportunities for visitors. Occasionally these three conflict and park management has to make tough decisions. Let's start with the historical significance of the Indigo Tunnel. All you have to do is travel the canal upstream and the rivalry between the C&O Canal and the railroads becomes strikingly clear. Starting at Point of Rocks, Maryland, the two forms of transportation run side-by-side for most of the 136 miles to Cumberland. One of the few places where these two lines diverge is at High Germany Hill near Fifteenmile Creek. 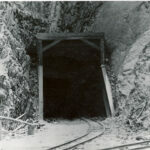 Here, the Western Maryland Railway constructed a tunnel through the mountain in order to cut off a large bend in the river. 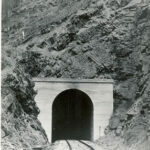 This tunnel, known as Indigo Tunnel, is 4,350 feet long and eliminates over a mile of track had the railroad continued to parallel the river. The Indigo Tunnel is the longest such tunnel on this route. For comparison, the Paw Paw Tunnel is only 3,118 feet long. 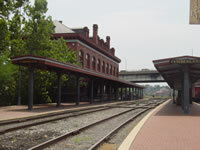 Indigo Tunnel provided an important transport route for the Western Maryland railroad until the company abandoned the line in 1975 after merging with the C&O and B&O railroads. The park acquired the tunnel in 1980. 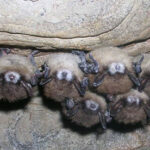 Eight different species of bat now call the Indigo Tunnel "home," including the Maryland state endangered small-footed myotis and the federally endangered Indiana bat. The Indigo Tunnel has been identified by Maryland Department of Natural Resources as one of the largest bat hibernacula in the state. Each of these bats during the summer can eat over a thousand insects an hour. In fact, bats provide up to $53 billion worth of ecosystem services to the agricultural industry from the pest control they provide. In some areas, bats and human activities can easily coexist. However, bat populations in the United States have been on the decline since the disease known as White Nose Syndrome (WNS) was discovered in New York. 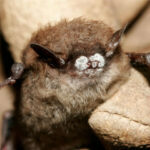 WNS is a fungal disease that has been rapidly spreading among hibernating bat colonies throughout the eastern United States and decimating the bat population. This fungus can be spread by both people and other bats. 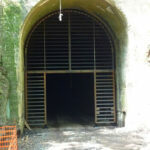 For this reason, the park has placed metal gates at each portal of the Indigo Tunnel. Although we know many people would like to gain access to the tunnel for recreational reasons, the plight of the bats must take precedence at this time. We are asking that everyone obey the signs and help us prevent the spread of White Nose Syndrome.